There is deep and abiding interest in matters of an educational nature. Increasingly print, radio, and television coverage refer to educational issues. Some people pay little attention to what is being reported about education because they feel it to be inconsequential. There is also a belief that what is reported, misconstrues facts. That to some extent may be the case; however it is important to be aware of the way education is trending within the community. Retaining information about education can be useful. There are various ways and means of doing this, but it works best if collation is organised regularly (almost on a daily basis). Newspaper items can be clipped and pasted in a loose leaf file, indexed book, or similar. Indexation is important as it allows you to quickly refer to things you may need to recall. Photographing news clippings using an iPhone or iPad, saving them to your pictures file, then creating an album for clippings is another method that works well. Scanning clippings and saving them onto USB stick is a method that works well. Again, indexing the USB file helps. It may be that you choose categories to index under, rather than an “A” to “Z”approach. Clippings files can be backed up on iCloud or otherwise saved onto computer or USB. From experience, the use of newspaper clippings when it comes to social and cultural education, cruising for general knowledge, for stimulating discussion in class, are but three ways in which they can be of use. Clippings can also be used to stimulate the content of debates, the writing of persuasive arguments for older students and so on. Awareness of issues can stimulate professional discourse including helping to shape the way in which members of staff develop collaborative programming to support teaching in schools. I believe teachers would find a study of media and the establishment of a clippings file useful and worthwhile. As a profession, teaching is at its most viable when members respect and support each other in a fully collaborative manner. The joys and challenges of teaching should never belong to those who remain in isolation from each other. A strength of teacher education is the encouragement offered trainees to link with each other in discussion groups either in person or by discussion boards on Learnline . Observation confirms the help those preparing to teach can help each other on matters varying from assignment tasks to practice teaching rounds. Carrying quality communications habits into teaching beyond graduation is wise. There is a misnomer that to share matters of challenge is a sign of weakness. That is far from the case. Those raising issues often find that colleagues are having similar issues or have developed strategies that help with mastery of similar difficulties. A problem shared is a problem halved. Many universities have developed or are establishing alumni groups. Keeping in touch with colleagues through the university post graduation offers professional sharing opportunities. Sharing through professional associations is recommended. There are maths, science, literacy associations among a host of others. Belonging to associations enables members to keep abreast of trends. Opportunities for personal professional development along with contributing to others through group membership is enriching. I would recommend a consideration of joining ‘LinkedIn’. This site enables members to build up a global contact base with like minded people. Members can join specific interest groups, sharing global ideas. Maintaining contact with the graduating peer group is another way of keeping in touch. Whatever the preference, keep in touch with others because that helps support both individual and collective strength. “Show and Tell” is often considered to be a way of filling in time. It gives children a chance to share a little about themselves or their activities with classmates. It is generally informal and there is no structure around this part of the program. Show and tell can be transformed into a very meaningful classroom segment. It can also be engaging for all class members. Here are some ideas. * Ask selected students to be ready with specific questions of the presenter. * Similarly, have students pre-prepared to offer commendations and recommendations for the presenters consideration. * With the class, prepare an evaluation template that covers elements of speech and speaking. Work with the class to ensure that the template takes account of ‘matter’, ‘manner’ and ‘method’ as key presentation elements. * Draw up with students a class roster that enables all children to have regular turns at parenting and evaluating. Focus on speech parts including the beginning, middle and the end if an oral presentation. A similar raft of skills can be developed to cover speech evaluations. Show and tell should be a meaningful and looked forward to part of the program. There is a great deal of relevance in encouraging children to speak, listen and appreciate with confidence. One of the strongest attributes of the teaching profession is that of ‘fraternity’. Collegiality and sharing are elements of that togetherness. Unlike some occupations in which people feel they have to sit on problems or challenges and muddle through, teaching invites those with questions to seek assistance in finding answers. This does not mean teachers should not have a go, but rather that they seek support to help in reaching satisfactory outcomes. This might include asking for clarification when a particular theory or teaching practice is not fully understood. It could be that teachers are struggling with classroom management, that discipline policies need explaining; a myriad of issues may press upon the teacher’s mind. They will remain there unless help is sought or given. Teachers are often credited with having a sixth sense. Part of this is having the intuition to understand matters that others might be finding confusing and offering advice or support. Gumption needs to be a characteristic that allows teachers having difficulties, to ask for help if it is needed. It is not a sign of weakness or inability to ask for support in understanding matters that are not fully comprehended. If there is a need ‘sensed’ in others, ask if they would like assistance. Two way caring and sharing should be informal, a part of the relationships that establish between members of staff. In some cases, mentors are assigned to staff members new to a school. Building a two way professional relationship with a mentor or coach is wise. Beginning teachers can contribute to these relationships for they often have a better understanding of new methodologies than those who have been in schools for a number of years. Therefore meaningful two-way relationships can be established. Keeping in touch with each other in a professional context is essential to the professional growth of teachers and school staff members. If problems are not shared and help not sought, worry, despondency and despair can set in and infect the soul. It is indeed sad if this happens … and it need not! Caring and sharing are attributes to be cherished and practised. In today’s world, emailing has become possibly the most common form of written communication. Most people have email accounts and use emails prolifically. Schools and teachers have email accounts, often displayed on the school’s website. Communication by email is encouraged, including contact between parents and teachers. Notwithstanding the ease with which email communication can be used, it is important consider a cautionary approach to its use. This is because emails are written documents and can be held against writers for years and years to come. excursion information or similar, response is fine. leadership team and forward email sent and you reply to your senior. take prime ownership of possible outcomes. * It is wise to keep copies of emails sent too parents in a designated folder. teacher at some future time, not having a record can be very unhelpful. The above dot points could be extended and others added. Suffice it to say that the use of emails can be fraught with danger, a situation that all too many people find to their eternal sorrow. Stick to material issues and don’t enter into the realm of value judgements and character comment. Parents may send emails of this nature, asking to you comment on their perceptions. That invitation should be avoided because response means they may quote you and tie you to what is really their position. Never ever write and send emails in the hear of the moment, while over-tired or while less inhibited than usual because of the use of alcohol. The reasons for this advice should be obvious. If in doubt on the subject of email correspondence, check with a senior staff member. It is always better to be sure than sorry when dealing with email traffic. From time to time teachers will be asked to prepare presentations for colleagues, school staff, parents committee meetings, and possibly for other audience groups. Used to working with children and students in a classroom context, presentation requests take teachers outside their normal comfort zone. Suddenly they are confronted with a new arena. Quite often people who were asked to prepare a presentation react with stage fright. Presenting in a formal or semiformal matter is something that causes them a great deal of nervous reaction. Some become so nervous they refuse point-blank to participate. In an informal or social context people are comfortable to converse and exchange experiences. Yet when asked to present to the same people and others more formally, those selfsame and confident communicators clam up! There is no doubt that the first time is the hardest when it comes to presentations. Relaxation of the mind and not anticipating “the worst” is critically important. I would strongly recommend to teachers and indeed to all professionals that they consider joining Toastmasters, Penguins, or some other speech and speaking club. Membership of such groups enables people to develop confidence when it comes to speech presentations. Graduated programs help recognise the essential ingredients of speech. Graduated development means progress in understanding the rudiments of a presentation with presenters building on previously acquired skills. Membership of these groups also facilitates critical listening, with a view to members evaluating each other and through that process honing their self evaluation skills. There are many people in high places who have great difficulty when it comes to presenting. Some have managed to sidestep the challenge by resort to PowerPoint presentations but the essence of delivery can be stilted, uninspiring and predestinated to leave the listening audience feeling bored, flat and unconvinced. Speaking up with confidence does not come naturally to a lot of people. However it is a skill that can be acquired and once gained builds confidence in people called upon to make formal presentations or contribute to organisations and groups. Details of such groups are often available by word of mouth, online, and through telephone book entries. Although membership has a fee attached this can be tax-deductible because it has to do with professional development. I unequivocably recommend this course of action for your consideration. May the following thoughts prove of use. When counselling and offering recommendations, look for areas of strength and accomplishment. Offer commendations to counterbalance advice so people in feeling good will be more receptive to counsel. When dealing with others in professional and personal matters, be empathetic. Treat and respectthem as you would like to be treated and respected. Be firm, resolute and avoid hurtful put downs. When dealing with people, be they students, parents, teacher peers, superordinates, adminstrative staff or others, place yourself in their shoes. This is empathy enhancing and builds understanding. Before making decisions, stop and consider whether those same decisions have been previously made then dropped for reason of being unsatisfactory. Avoid revisiting previously failed initiatives. True delegation includes decision making along with task sharing. If tasks are delegated but decision making retained, this can be intertpreted as a lack of confidence in the tasked person. PRIORITISATION is important. My suggestion would be family, work and recreation in that order. To avoid taking work home can be wise because work can sully both family time and recreational pursuits. ANECDOTAL AND EMPIRICAL EVIDENCE – A MISMATCH? paths. Yet we defer action or are counselled not to proceed because empirical evidence is not available for verification. Our profession is best served when people share their thoughts, ideas and perceptions with each other. It is as important to receive and consider advice as well as sharing our ideas with others. No matter where we are positioned within education, there are three qualities that should be part of our make-up and character. ‘Honesty’, ‘respect’ and ‘integrity’ are those key characteristics. At the risk of sounding too old fashioned, I extol the virtues of story telling. These days, with the advent and use of smart-boards and connecting devices, teachers often use audio-visual technology when it comes to story telling and story readings. Teachers should not feel reluctant about telling or reading stories to children. Sadly, the skill of story telling is becoming a lost art. To tell stories with and to children is to engage with them in a primary conversational context. Stories told with animation and conviction, with supporting gesture and eye contact, engage children and switch them on in a way that draws them close to the message being conveyed. * The quality, meaning and context of language, word usage and meaning can be followed up by discussion during ‘conversational pauses’ within the story or at its end when the story is being reviewed. * Questioning to test listening helps to build the notions of concentration and listening. To have ‘mini quizzes’ where there is some sort of contestation build within the group (for instance, girls versus boys, contest between class groups and so on) adds to student focus and engagement. This strategy discourages students ‘switching off’ and mentally wandering off into the distance. * Having students work on ‘prediction. and ‘forecast’ by sharing their thoughts about where the story will head and how it will conclude can be an interesting and testing strategy. This approach helps develop the skills of logic and reasoning within thinking. * Language study is enhanced. Asking children the meanings of words and words within context is an example. Similies and antonyms can be developed as a part word studies. The possibilities are endless. * Some texts which share stories are written in the ‘language of yesteryear’. There are two volumes that come to mind, being ‘Grimm’s Fairy Tales’ and stories by Hans Christian Anderson. These stories not only introduce children to a vast array of very colourful old fashioned words that have been superseded by the idiom of modern language. They are also set in social situations of the past, largely replaced by the social attitudes and disposition of today. * The appeal of stories to imagination and ‘the mind’s eye’ is such that art growing or flowing from story presentation can be colourful and creative. * A great way of treating longer stories, is to serialise (or mini–series) them, with ‘to be continued’ as part of the understanding. That is a great way of helping children anticipate what may happen. * Make sure when telling stories to use clear, expressive language. Take the part with language variations of the characters described. * Engage children by asking them to respond by being characters in the story. Have them thing about and describe the characters, moods and attitudes of those around whom the story is centred. * Have children act or visit the story or parts thereof through dramatic expression. Drama is a subject very rarely considered these days. * As a story teller, make eye contact with the group. Vocal expression is important including pitch, rhythm and other elements of speech. It is a sad fact of life that adults tend to lose the capacity to imagine as they get older. To engage in story telling is to keep the imagination of the story teller alive and flourishing. As a school principal, I used to talk with children about the importance of imagination and imaginative thought. To tell stories has helped keep me in touch with this advice. While research is important, a downside is that schools and students are forever on the end of guinea pig treatment. While research signals and stimulates advances, there has to be oportunnity for education to be forwarded in a steady state manner. Schools can be pushed, pulled and pummelled by every idea coming from research, making them places in a state of constant disequilibrium. Principals and school leaders together witrh community need to make careful choices about involving or otherwise in pilot program or as testers of new initiatives. My advice would be not to put the school’s hand up for every new suggestion; doing that makes for giddy staff and disopriented students. Additionally, ask students for their thoughts on new ideas – after all they are the group principally affected by change and their advice, thoughts and ideas are asked too infrequently. These columns were published (with some editing) in the Suns in February 2015. Readers are welcome to use material herein. Care needs to be taken when new educational initiatives are being considered. Accepting change for changes sake is not always the wisest option. 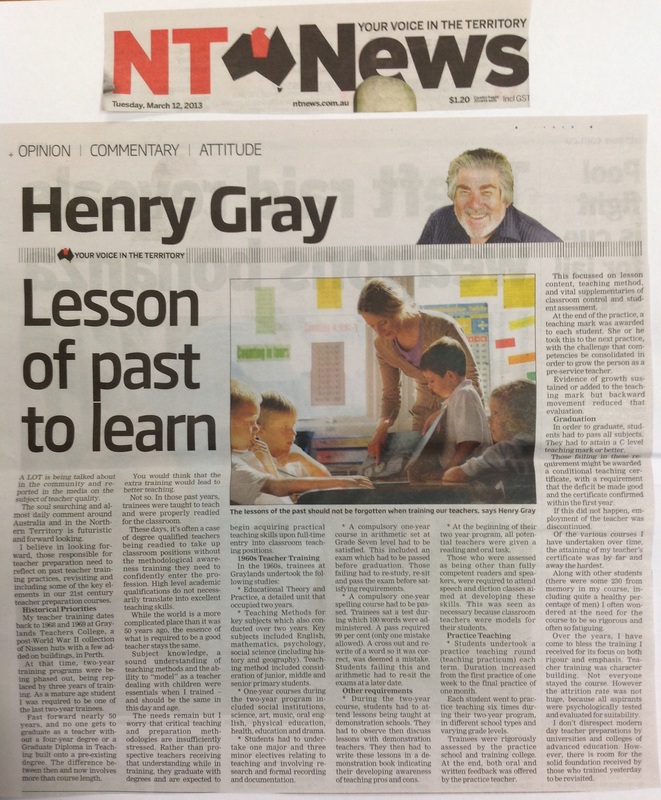 One of the trends gaining momentum in both the Northern Territory and around Australia is that of Open Plan education. New schools are being constructed without interior walls. In other cases established schools are being renovated to remove interior walling, creating large open learning areas. It seems that of linear (single) classrooms are out of fashion. Open plan schools are not new. The idea grew out of the United states and the UK during the late 1960’s and 1970’s. The model has grown and been accepted by other countries, including Australia and the Northern Territory from the mid 1970’s. With open plan classrooms the emphasis is on the child learning rather than the teacher teaching. The teacher’s role is to provide resources, help children make choices about what they want to learn, ask questions to guide their interests and to comment on the work children are doing. There are many children with a number of teachers and support staff working within an expanded space. Working in an open plan system demands that staff are able to work together in a fully collaborative manner. Embracing open plan education or any other approach should never be rushed. It is important that pros and cons be considered. Included should be consultation embracing staff, school council or management board and the parent community. I believe that students should also have a chance to understand and express their opinions, because change will impact upon them more than any other group. Careful planning for this or any other change will ensure that stakeholders are not taken by surprise. To introduce change in any other way can destabilise relationships within the school and community. In February every year the Northern Territory Board of Studies recognises the accomplishments of Northern Territory Students. This years celebration was held in two stages. On February 5 a ceremony was held in Alice Springs for students attending schools in the southern region. Last Friday the Northern Division function was held in the main hall of Parliament House. Students from Darwin, Palmerston, Katherine, the rural area and throughout Arnhem Land were honoured. The MC was BOS Chairman Mr Ralph Wiese. Students were recognised for academic, technical and vocational education success. Both private and government school students were applauded for their 2014 results. Each recipient received a certificate and monetary reward. The top 20 Northern Territory Certificate of Education students where also recipients of trophies that will forever remind them of the hard work, dedication and commitment they devoted to their studies. Students are recognised for subject excellence for example English, legal studies, Biology, Mathematics, and so on. Awards for vocational educational Studies recognise the universality of education and preparation of students to enter into a wide facet of occupations in the years ahead. Two prime awards were presented on behalf of the Chief Minister.
. Most outstanding NT Certificate of education indigenous student.
. Most outstanding NT Certificate of Education student studying through distance learning. The most outstanding NT Certificate of Education Student overall, Anna Miers, the NT’s top NTCE student was presented with her award in Alice Springs on February 5. Anna completed her studies at the Centralian Senior College. A standout features of 2014 was that 19 of the 20 top NTCE students were educated in the public school system. Monetary rewards conferred upon students are considerable. It’s thanks to business, industry, a number of professional associations, Charles Darwin University and the Department of Education that many thousands of prize dollars are awarded, to assist students with tertiary study or occupational training. A highlight is the conferral of the Administrators Medal. Two medals, one for a primary and one for a junior secondary student recognise academic accomplishment, behavioural excellence and the modelling of citizenship qualities. Harrison Talbot (Clyde Fenton Primary) and Despina Sisois (Sanderson Middle) were worthy recipients of medals awarded by our Administrator the Hon John Hardy. Three awards were presented in recognition of outstanding Territory educators taken before their time. Sally Bruyn (Year 6 science Award) Vic Czernezkyj (Mathematics excellence) and Karmi Sceney (Indigenous excellence and Leadership) have awards named in their honour. A fourth, the Ian MacGregor Rotary Award for English Studies recognises a man who was dedicated to NT service. Along with 2014 awardees, over 1,200 other students successfully completed their year 12 studies. Much is said and written about the wrongs committed by our young people. This ceremony confirms that the majority of our upcoming generation are on the right track to theirs and our Territory’s future. Note: I hold observer status to the NT Board of Studies. At the beginning of each school year, it is important to know about or revisit some basic considerations. When taken into account they help to ensure the school year flows smoothly. * Enrolment forms, once a simple page in length are now many pages long. In order to satisfy all social and legal requirements, it is important that enrolments are completed correctly. Incomplete forms can lead to future confusion and misunderstanding. * Addresses and phone numbers need to be correct and updated if they change. It is particularly important that emergency contact details are accurate, because contact needs to be immediate if there is an emergency. * Many schools have developed behaviour management policies requiring parents and students to read and sign an understanding of disciplinary processes and behavioural expectations. During enrolment, a discussion which includes students can help avoid misunderstanding. * An immunisation history is included as part of enrolment procedures. This allows schools to be aware of students who may have not been immunised for particular communicable diseases. Parents are then informed if there is an outbreak of measles, chicken pox and other notifiable diseases. Phone contact with parents of non-immunised children is usually made, providing the school has that detail. * While schools have sick bays, they are only for short term use. Parents of children falling ill during the school day are contacted and asked to collect them from school. Sending unwell children to school is unfair on them. They can also become a source of infection for other students and staff. * Head lice infestations regularly afflict students, particularly those in early childhood and primary years. When schools send notes advising of head live outbreaks, it is wise to check heads at home, treating children if necessary. Students identified with louse infestation at school are generally excluded from classes and parents contacted about the matter. * Schools have rules regarding use of play equipment and playing time. They are designed to encourage positive and accident free play. If accidents happen, parents are contacted. Most schools have ambulance cover in case children need to be taken to hospital because of broken limbs or similar misadventure. * Most schools have high quality and regularly updated websites. Consider bookmarking the website of schools children attend as it helps keep up to date with what is happening. Some schools also place their weekly or fortnightly newsletters on the web. It is good policy to check the website at least weekly. * Notes, newsletters, teacher letters and other information bulletins are sent home from schools quite regularly. Sometimes children forget about delivery. Regular checking of schoolbags can turn up information that would otherwise not be received. * Be aware of speed restrictions in school zones, which apply from 7.00 am until 5.00 pm each school day. Most schools have short term parking for drop off and pick up of children. Speed and parking rules meet safety and student well-being needs. * Roads in the vicinity of school become clogged with traffic in the periods before and after school. Driving to speed restrictions and other care including parking, watching for children darting out between cars is necessary. * Schools in the NT set their own commencement and conclusion times. Arrival of children 15 minutes before the school day commences and collection no more that 15 minutes after the day concludes is ideal. Children arriving too early or leaving school ground too late in the afternoon are not subject to pastoral care and supervision. Parents who are unsure about school processes and procedures should ask the school for clarification. This is part of ensuring that relationships between school and home are positive and happy. In our modern times schools, especially primary schools, are supposed to be all things to all people. Parents are increasingly engaged with work commitments extending from early in the morning until quite late in the afternoon. It is small wonder that an increasing number of children spend time before and after school in care programs. Many children are at school by 7.00 o’clock in the morning and do not leave care programs until well after 5.00 o’clock each afternoon. These programs were few and far between until fifteen years ago, but have proliferated since then. Most school councils accept responsibility for Outside School Hours Care (OSHC), providing after school support for children. The number of before school care programs for children are increasing. Children are spending more hours each day in school and care programs than at home. Preschool now commences for most children at the age of three, with timetables providing for full day rather than half day programs. This has been designed to fit in with parents work. These key structural and organisational changes have contributed to redefining educational priorities. Pre and primary schools are as much about child care as education. This is added to by the fact that community expectation seems to be that children will be brought up by the combined efforts of parents, teachers and child care workers. That used to be the sole responsibility of parents. If schools organise pupil free days for professional development, the response from many parents is one of concern because child care for that day changes. Children either stay at home (with work implications for parents) or are booked into all day care with cost increases. In these modern times, parental responsibilities have in large part been outsourced to secondary caregivers. Governments have reacted to community pressures and endorse institutionalised nurture and care as being a good substitute for parental time and attention. The justification is that parents are so busy working to boost the economy and sustain the home front, that key parenting responsibilities have to be outsourced. ‘Schools are for children’ stated our first Educational Director, Dr Jim Eedle in 1979. Eedle was defining the prime purpose of schooling in an educational sense, taking account of academic and vocational needs. Schools are still for children but expectations have widened to the extent that education is but one element of their charter. The community expects schools and teachers to be involved with the bringing up of children. Schools and staff play an important part in the development of children. However they can never take the place of parents. Without doubt, parents are THE primary caregivers for their children. That responsibility should never be outsourced to secondary providers and government agencies. Schools can do their bit. However if parents fail their obligations, children will be the losers.